Jack Skellington is the protagonist in the Disney film Tim Burton's The Nightmare Before Christmas. Jack is the "Pumpkin King" of Halloween Town and lives in a fictional world based solely on the Halloween holiday. His usual appearance is a skeleton dressed in a black pin-striped suit and a bow tie resembling a bat, but there are some points in which he dresses as a scarecrow with a pumpkin for a head. His name is a pun on skeleton. He has a pet ghost dog named Zero, who has a small glowing nose that looks like a Jack-o'-lantern. His love interest is Sally, a rag doll created by Dr. Finklestein. 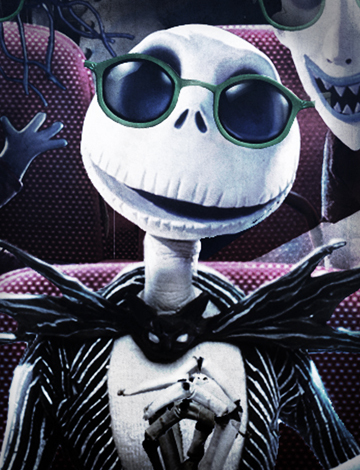 Jack is voiced by Chris Sarandon, and his singing voice is provided by Danny Elfman. The original Jack was portrayed by Johnny Depp. Danny Elfman is an amazing singer! Always a big favorite around Halloween. Do you know I have the DVD of this film and still haven't watched it! Guess what I'll be doing later? LOL.